Because trains are often filled to the brim we suggest taking the shuttle bus a taxi into the city if you are loaded with luggage. But if you are traveling light, the Suvarnabhumi Airport Rail Link (SARL) is a convenient and cheap way of transferring from the airport to many locations within Bangkok and link up with the BTS skytrain and MRT underground. Traveling from the airport tickets are bought on the ground floor of the airport terminal. 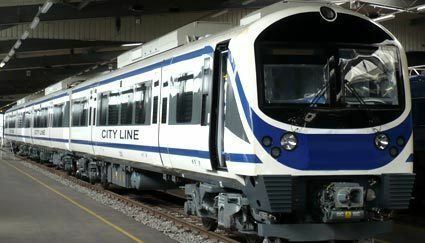 The rail link offers 3 travel options; the city line, Paya Thai Express and Makkasan Express line. We briefly discuss each option. The city line runs back and forth between the airport and Paya Thai Station SARL. It can also be used as a commuter train since it stops at 6 stations between the airport and Phaya Thai Station. These are Rajaprarop Station, Makkasan, Ramkhanhaeng, Hua Maak, Baan Tubchang and Lardkrabang Station. The cost one way is 45 Baht and travel time is 30 minutes. At the SARL Phayathai station you can cross over to the Phayathai BTS skytrain which forms part of the Sukhumvit line connecting to the rest of the city. 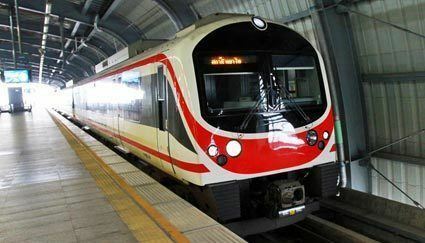 If you need to commute between the city and airport faster the Phaya thai express line travels direct without any of the stops mentioned above. One way travel time is 15 minutes and cost 90 Baht one way or 150 Baht for a round trip. If you are traveling on the MRT underground and want to connect with the airport rail link you can do so at Makkasan station. This is also a direct express train which takes 17 minutes from the City Air Terminal (Makkasan) train station to the airport. In this case luggage won't be a problem. Passengers will have the opportunity of checking in their luggage at the City Air Terminal before boarding the express train to Suvarnabhumi airport. A one way trip will cost 90 Baht and round trip 150 Baht.